Reports from Maiduguri claim seven explosives have rocked the Borno State capital, just hours before the presidential and National Assembly elections. It was learnt that the sounds of the explosives started at about 5:50am on Saturday morning. 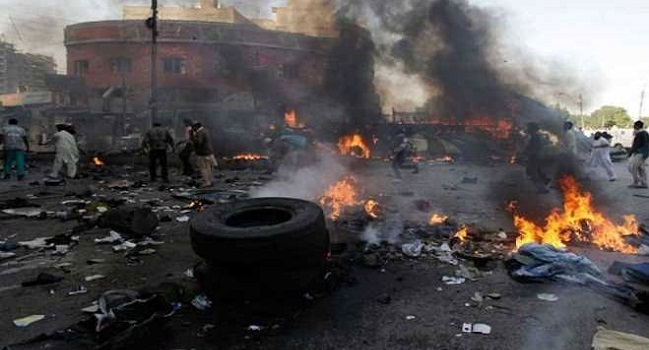 There is currently no report of casualties in the explosions and gunfire which occurred around Molai, Dambo’a road, Bulumkutu and Njimtilo road axis, as well as from other parts of Maiduguri metropolis. The development is coming despite government’s assurance to citizens and electorate that security had been beefed up to ensure their safety. Ahmad Salkida: Just In: Explosions in #Maiduguri moments ago. Over 10 heavy bomb blasts so far in #Maiduguri. The situation seems to have been contained by the #Nigeriantroops. Hopefully people will be assured to go out and cast their votes, but there is also the urgent need for air surveillance and body search of every person walking in the streets of #Maiduguri. Shettima Kullima: Is it just me or did I hear the sounds of bombs explosion within Maiduguri? Third explosion shook my room… Subhanallah, Ya Allah protect us. Mubaarak: #NigeriaDecides2019 I think terrorists should have known that residents of Maiduguri are used to these sounds of explosions. Even if we have to go out under heavy fire, we will still go out and vote. No terrorists attack will stop us from going out to vote. We are not afraid!!! Hamma: Maiduguri is under siege, may God save my town . Bombs keep exploding in Maiduguri, 4th bomb just exploded, please stay safe, let me call my people to stay home and observe before any movement.